Amalfi has two larger beaches on either end of the town, the long and pebbly Marina Grande beach and the rocky Le Sirene beach behind the port. If I’m looking for a lively beach atmosphere, I head to the popular Marina Grande. For a bit more seclusion and quiet sun bathing, I go to Le Sirene. 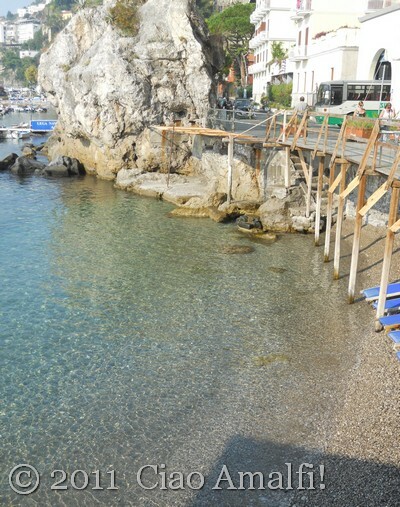 In between these two beaches along the port of Amalfi, you’ll find three other small beaches where few tourists stop. 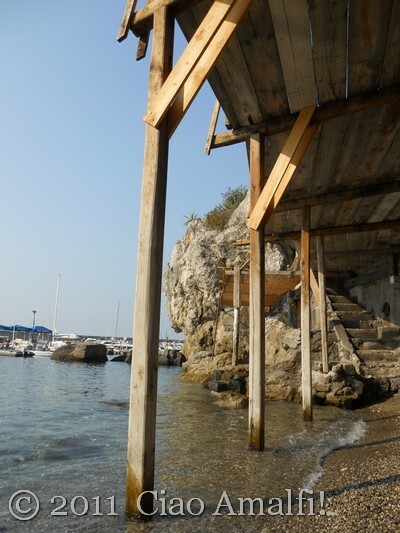 My favorite spot for swimming in Amalfi is the tiny La Marinella beach, located next to the restaurant with the same name and not far from where the boats to Positano, Capri and Salerno depart. This tiny beach is very popular with the Amalfitans, who stop to lament every spring during the evening passeggiata that the pebbly beach is getting smaller and smaller. In recent years they have been building a deck over the top of the beach to provide more sunning area, which has been a big success. The allure of La Marinella is the calm, crystal clear water – just like a pool as the locals say! The way it sparkles in the sunshine is incredibly tempting on a hot summer day. Since the beach is small and quiet, this is a popular spot for families with young kids, who tend to come first thing in the morning when the sun isn’t so instense. As a result, it can get a bit crowded and noisy during the summer months. My favorite time to swim at La Marinella is in May and late September when school is in session. Last Saturday morning we went there for a swim and were among the first to arrive. As the port of Amalfi hummed with boats coming in and going out, buses loading and unloading tourists for the day and the shops opening, we enjoyed a moment of absolute calm at La Marinella. 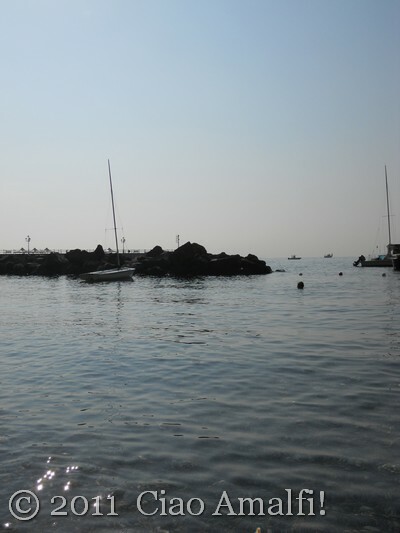 If you’re traveling to Amalfi with young kids, this is a lovely spot for a relaxing swim. The stones on the beach are small, which means it’s a little easier on the feet compared to Marina Grande. Or, if you happen to stroll by on an early morning, when there’s no one about yet, it’s one of the most peaceful places to spend the morning in Amalfi! 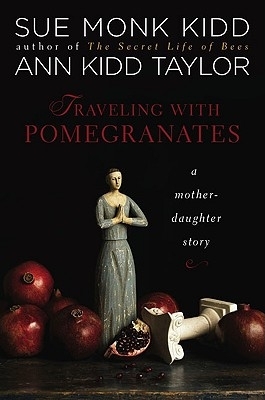 A few years back now, my mother read Traveling with Pomegranates: A Mother- Daughter Story by Sue Monk Kidd and Ann Kidd Taylor. I don’t recall now just how it happened–chance, a recommendation, a gift–but I do know it was a treasure. As she read the story and shared about it with me, it became an important part of our own mother-daughter story. I’ll always think of my mom when I enjoy the strange sweetness of a pomegranate. That year she gave me the book, and I’ve had it sitting in a treasured spot on my bookshelf waiting for just the right time to read it. How would I know just the right time? I couldn’t have told you if you asked, but I knew I would feel it. I wouldn’t have been able to tell you that it would be August 2011, but it did turn out to be just the right time. As I read this beautifully written mother-daughter memoir, I found myself associating on so many levels with both Sue and Ann. The daughter as she struggled to discover and let blossom her passion for writing, and the mother for her search for peace within herself, especially finding peace with the desire to write fiction. Both Sue and Ann write about their travels together in a compelling, deeply thoughtful and personal way. As they explore ancient religious sites in Greece, Turkey, France and also cope with major changes in their personal lives in South Carolina, both mother and daughter find themselves coming together. As the perspective changes from Sue to Ann, we see their relationship deepening and widening. The beautiful settings form a backdrop to the real action happening inside both of them. With their simple and captivating writing style, it’s an extraordinary experience to be able to join them on this journey. While reading I came back time and again to my relationship with my mother, the most influential and treasured relationship in my life. It’s difficult to express the gratefulness I feel for having my mother and my best friend as a companion in life’s adventures. They are deep feelings that are hard to put into words, and I treasured having the chance to hear two talented writers explore this moving topic. As she does many moments throughout the story, Sue Monk Kidd finds the perfect quotation to end the book that pulls together and captures the spirit and love that both mother and daughter express through their writing in Traveling with Pomegranates. Anais Nin wrote, “We write to taste life twice, in the moment and in retrospection.” To taste life once through the eyes of a talented writer is one of life’s greatest pleasures. Two at the same time is a rare joy. The last few weeks it seems like all I do is hurry from one place to another. One of the first ways I can tell that I’m too busy is by looking at my camera. Hardly a photo taken in the past three weeks, except the new flowers I spent an early morning planting in the garden recently. And then this one flashed across the computer screen as I was downloading photos yesterday morning. I had almost forgotten about the afternoon last week when the huge cumulus clouds seemed to be creeping over the mountains. I watched them all afternoon, hoping they’d bring some much needed rain to the Amalfi Coast. But they just seemed stuck there in the moutains, as if peering over to admire the view themselves. I’m happy that I took a moment to admire the clouds, even on a busy day. Wishing everyone a relaxing and sunny weekend! Life has been busy, a little too busy, the last few weeks. But I’m intent on not letting September and October slip away as they are my favorite months of the year on the Amalfi Coast. I love the close of summer, when the sun is still strong and the sky a brilliant blue. Yet, at night there is that cool breeze winding its way down the mountain valleys that is one of the first signs the season is changing. I haven’t had a chance to enjoy being in the garden much this summer, but my seeming lack of concern isn’t a representation of how much it is in my thoughts. After poking around and looking after a rather dismal garden for just about five years now, I am finally ready to make some major changes. But it is work that will come in its own time, and most of which must be done early next spring. 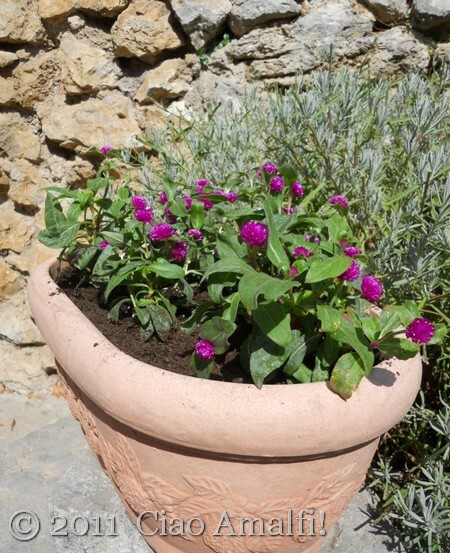 But, for the moment, the empty pots in the garden needed a little burst of color. I set out bright and early one morning last week to the market in Ravello, and came back with a rather large load of plants and a bag of dirt on my scooter. I’m sure the ride home wasn’t ladylike, but it was a heck of a lot of fun! I don’t know the names of either of the plants I brought home, but I liked how their color mimicked the bougainvillea blooming in the garden. I filled one pot with these purple flowers above, which make me think of what would happen if a thistle met a mum in a field of sage and fell in love. I open the front gate when I come home to this floral romance, and it makes me smile, even if it’s been a long day. 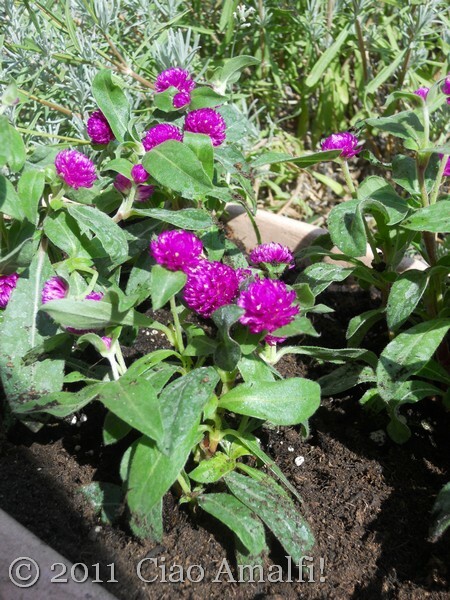 These are the other plants I bought, and no idea on the name either. No romances here, but I do love the tiny bright purple flowers. 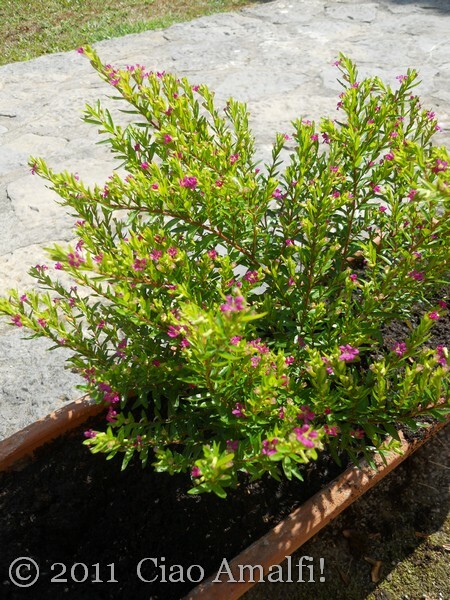 Right now the plant is about 10 inches tall, and the flowers should bloom up to about December. I’m hoping they’ll live through the winter, and if so they’ll be rewarded by being transplated to another spot in the garden next spring so I can fill the vases along the walkway with summer flowers. And, in the meantime, I will keep squeezing in moments each week to work in the garden. It’s a good exercise in breaking the negative habit I have to wait until I have plenty of time to tackle a project. “Plenty of time” rarely comes along, and I know I need to work in small pieces. I’ve discovered that gardening is a wonderful exercise in practicing this new habit, as the rewards are so sweet! If you have an idea on the names of either of these plants, I’d love to hear! 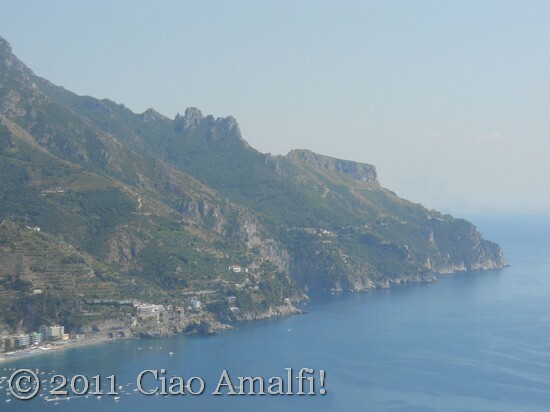 The last two times I’ve shared mystery flowers on Ciao Amalfi, someone has always been able to answer. Here are the latest mysteries to solve! One day I was having lunch on my own in Ravello, or at least I thought I was having lunch on my own. I looked up from the table to see along the top of the mountains the face of a man with a bulbous nose and prominent chin. 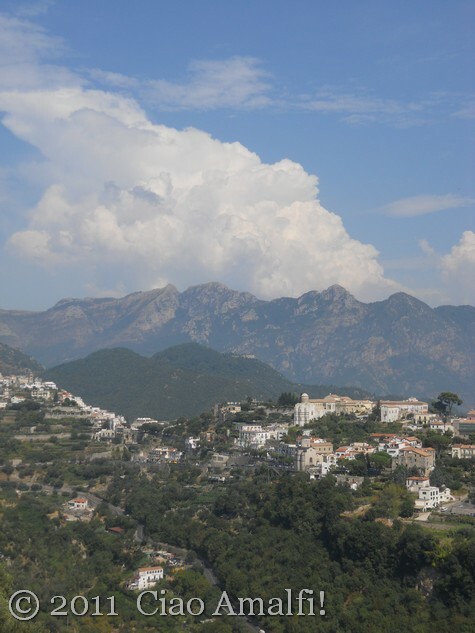 I’ve heard locals point out several faces in the outline of the mountains above Maiori. For me, this is the Old Man of the Mountain sleeping above Maiori. Although he slumbers, he’s pretty good lunch company seeing as he always brings a smile to my face. 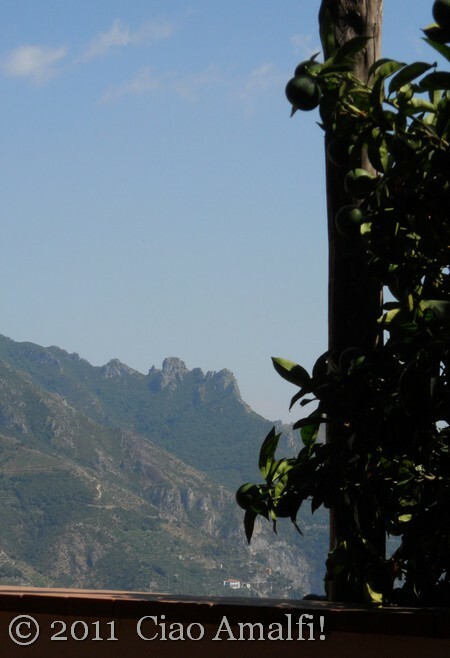 For more faces of the Amalfi Coast, check out Rock Solid – a fabulous post from the archives of Bell’Avventura in Positano!